Having been on vacation when the big news about Transmogrification was announced, I naturally missed the rush to make posts about Where To Find Cool Stuff To Wear. Anne, Rades, Jadiera, Angelya, Liala, and Perculia have already put out some great guides. 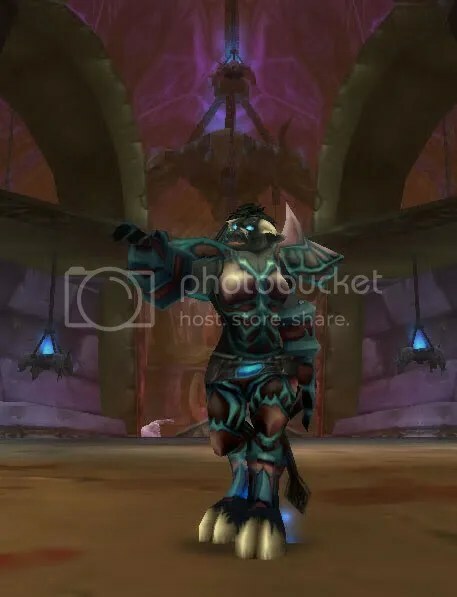 Wowpedia’s compilation of Dungeon and Tier set lookalikes is another valuable resource. Rather than provide another such exhaustive list, here’s how I’m approaching Transmogrification for my specific characters. Building a Transmogrification template kit is a little trickier than putting together an ordinary RP outfit. I can’t use any of Kamalia and Kerisa’s current RP ensembles because they are all mixtures of cloth, leather, and (in Kamalia’s case) mail items. All of the items in a Transmogrification template kit intended for active PVE or PVP use must be of the character’s armor specialization type. 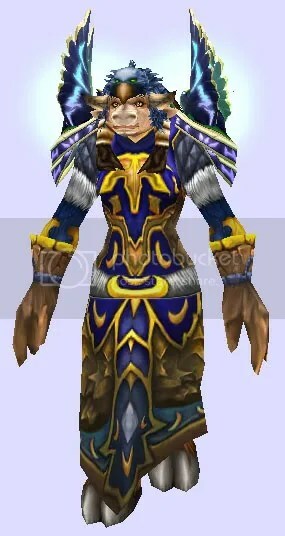 Thus, as a mail-wearer, Kamalia can’t go raiding in her Frostwolf Emissary lookalike garb — but a leather-wearer could. 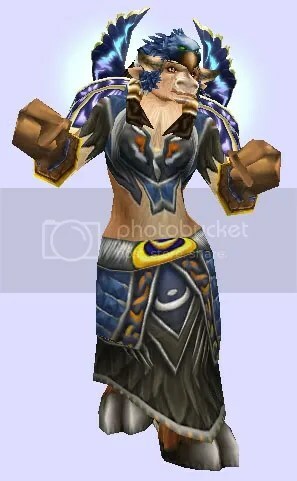 I consider the bare minimum Transmogrification template kit to be shoulders, chestpiece, gloves, and belt. Pants & boots are also necessary if the chestpiece is a tunic. Helms and cloaks are optional; if I can’t find a helm I like for my Transmogrified kit, or my current cloak doesn’t match it very well, I just won’t display those items. I’m also planning to use my current weapons without Transmogrification or to Transmogrify to old-favorite weapons that I already own, and not worry about seeking out weapons to coordinate with specific ensembles. I decided to start with the Tier or tier-lookalike items my characters already own and fill out the sets with items that I can obtain from the AH, by soloing old content, or with JP/VP. 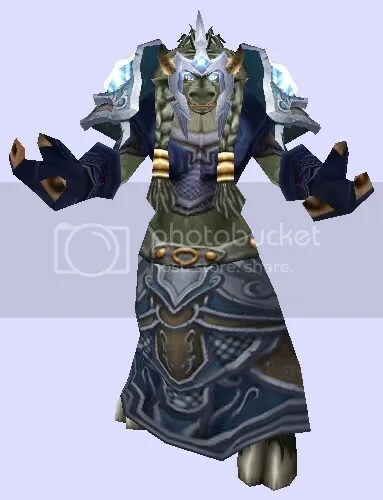 Kamalia has a full set of T10 (in a mixture of the brown-green version and the blue-grey version), T4 pants and shoulders, blue T7 chest and pants, T6-lookalike Frozen Forest Kilt, Helmet of Ten Storms, Mystical Pauldrons of Elements, and Mystical Vest of Elements. LEFT: Kara/Gruuls/Mags was my first raiding tier, although I never got my T4 chestpiece back in the day. I discarded my T4 at the beginning of LK, but recently reaccquired the pants and shoulders. Until I get around to running those raids for the T4 gloves and chestpiece, the Nexus-Strider items coordinate well enough. The hat is the Helmet of Ten Storms, and the belt is the Imbued Infantry Belt. RIGHT: Building an ensemble around the Frozen Forest Kilt without having to go back and run T6 content proved more challenging than I’d expected. I’d kept the blue T7 chestpiece with the idea that I could use it both with its own pants and with the Frozen Forest Kilt, but finding a belt that would tie them together appropriately took some searching. I ended up with the Renegade Belt. I matched the hat with the Ten Storms recolor Mantle of the Sea Wolf. The purple doesn’t quite fit the general deep blue color scheme, but it’s dusky enough to harmonize instead of jarring. For the gloves, I just looked for something dark, attractive, and easy to get, and I ended up with the Amberpine Gauntlets. A Blue Workman’s Shirt helps blend the whole ensemble together. LEFT: The Outland recolor of the Elements set, consisting of Lightning-Rod Pauldrons, Vest of Living Lightning, Girdle of the Gale Storm, Kilt of Rolling Thunders, and Stormfront Gauntlets. Shown with the Furbolg Medicine Totem and the Enamelled Disc of Mojo, both of which I already own. RIGHT: I prefer the darker colors of the Outland recolor of the Earthfury set over the vivid purples of the original. Volcanic Pauldrons, Worldfire Chestguard, Molten Earth Kilt, Earth Mantle Handwraps, and the off-set (but supremely stylish) Ornate Girdle. Although I like both of these sets very much, and look forward to being able to Transmogrify my gear to look like them — perhaps using the aqua Elements set for my Resto gear and the black Earthfury set for my Elemental gear — I don’t have any items from either one of them yet! I’m rather fond of my original Zul’Aman Enamelled Disc of Mojo, so I went out to Shattrath the other day and spent some of my overflowing JPs on the level 70 ZA intellect mail set. I don’t care for the matching hat, however, so I substituted in the Big Voodoo Mask… and only later remembered that because that hat is leather, I can’t use it in a Transmogrification template kit, after all 😦 I might wear the Big Bad Wolf’s Head with this set, or just go hat-less. Unfortunately, Kamalia has very little free bank space. She’ll need to wait for patch 4.3 and the advent of Void Storage just to have enough room to begin to collect all this stuff! In the meantime, I’ll work on finding the Nexus-Strider items and cajoling BTH into duoing T4 content with me to complete my Cyclone Raiment set. Kerisa has the Lasting Feralheart Spaulders, Feralheart recolor Kilt of Living Growth, Cenarion Belt, Headdress of the Verdant Circle, Mantle of Autumn, Phaelia’s Vestments of the Sprouting Seed, and a few pieces of T9 and T10. LEFT: I started with Phaelia’s Vestments and the antlers, then looked for a belt and gloves that would harmonize without having to go back to Ulduar. Luckily, I found them in the pre-T11 badge and rep gear — the Aessina-Blessed Gloves from Hyjal rep and the Thatch Eave Vines for JP. I really wanted to use the Mantle of Autumn, but although the yellow leaves coordinated nicely with the golden details of the robe, the turquoise twigs just clashed. I replaced it with the Somber Shawl, which matches the gloves. A Golden Filigreed Shirt rounds out the ensemble. The only item Kerisa will have to obtain to complete this outfit is the belt; she already has the gloves and shoulders. RIGHT: To the antlers, the Cenarion Belt, and the Mantle of Autumn, I added the chestpiece that matches the shoulders, the Raiments of Nature’s Breath. I’d like to use the Cenarion gloves, but until I can get into Molten Core to get them, the Grips of the Lunar Eclipse are probably easier to get and coordinate well enough. 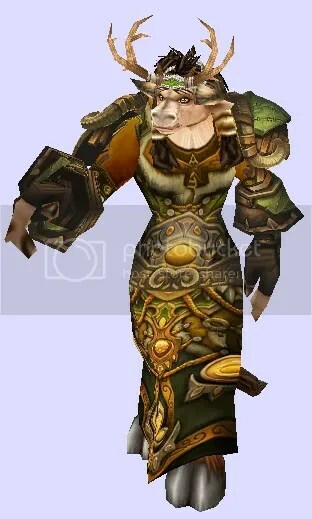 Of course, once I’m in Molten Core, I’ll be hoping to get the original brown and green Cenarion Robe and the original green leaf Cenarion Spaulders themselves. I like both color variations of these items about equally. These two ensembles play mix-and-match with the individual items I like best out of two sets. 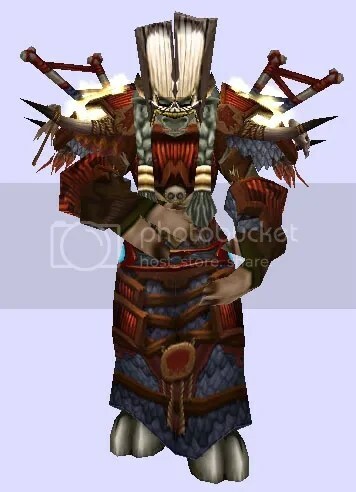 Along with the Lasting Feralheart Spaulders, I’ve used the Raven Heart Headdress, Tunic of the Nightwatcher, and Kilt of the Night Strider from the Outland recolor of the Feralheart set. I tried to make the Pants of Living Growth work, but they are just too green. 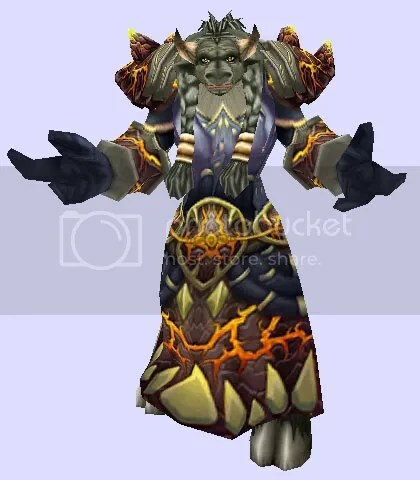 From the Outland recolor of the Stormrage set, I’ve used the Grips of the Lunar Eclipse, the Moonrage Girdle, and the Starry Robes of the Crescent. For the outfit on the right, I would be just as likely to use the Antlers + Mantle of Autumn combination as the Raven Heart + Feralheart combination shown. Kerisa has a bit more free bank space than Kamalia does. I’ll be picking up the Thatch Eave Vines right away, so as to have one complete Transmogrification template kit ready to go for patch 4.3, but I can also begin slowly collecting the various Outland recolor items. I’ve written previously about this set, which is easily farmed from Scholomance and Stratholme (with the exception of the DK-exclusive belt). I’m tempted to start making a list of potential components for a Blood Knight set for my recently dinged 60 Blood Elf Paladin to wear for the rest of her life (after she acquires all the pieces)… but in truth, that’s a project best left for after Kamalia and Kerisa have gotten their kits together. 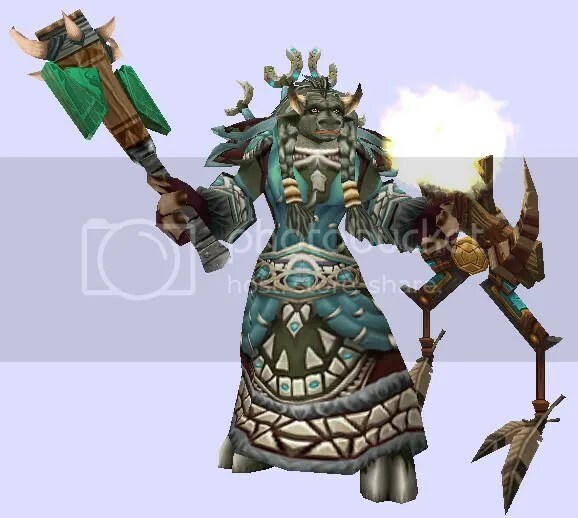 Uh oh, I sense that our druids are going to be lookalikes. 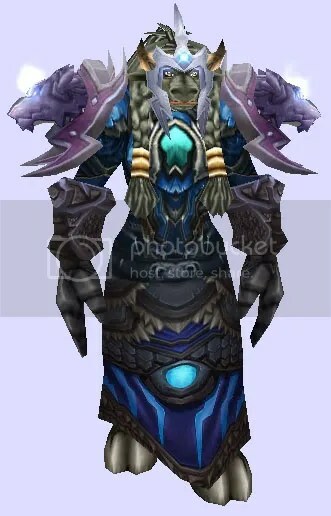 I planned this set as soon as I heard about the transmogrifying on the way, so I’m surprised to see our tastes are so similar. I have her in the Headdress of the Verdant Circle, Phaelia’s Vestments, and the Thatch Eave Vines. I’m already farming Molten Core for the Cenarion Spaulders I want to put with the outfit. With it I plan to put the Recovered Cloak of Frostheim (which I already have) and the Sandstalker Ankleguards that are actually footless boots and will make her look barefoot under the robe and the Gloves of Delicate Mixture that are real simple understated fingerless gloves. Phaelia’s Vestments are just so beautiful. Beyond that, they were probably one of my most expensive AH purchases ever. So I’m excited to be able to wear them more. If I already had the original green T1 shoulders, I probably wouldn’t have given any other pair a chance. 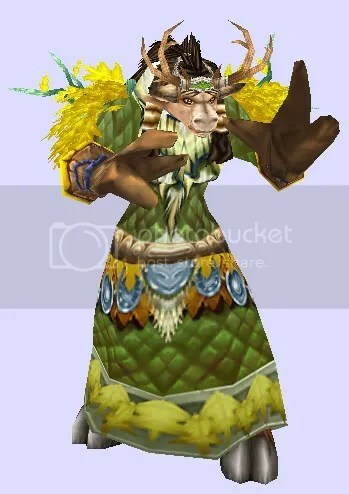 I looked at some fingerless gloves, but that style just looks funny to me on a Tauren. I did like the look of the Gypsy Gloves — little green gloves that just cover the hands and have the fingertips, but not the whole fingers, bare — but, sadly, they are a white, stat-less item.